Bullying takes a physical and mental impact on the victim. Understanding just how damaging it is can help us take it more seriously and stop rationalizing why we aren’t doing anything to stop it. We often think of bullying as a mental health issue. 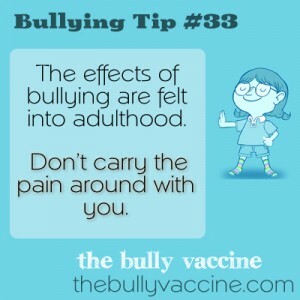 But it’s also a physical issue and we now know that bullying can cause lifelong impacts on our health. Increased stress can cause heart issues, digestion problems and more. When I was being stalked, I developed a “nervous bladder.” My urologist said it’s literally a physical manifestation of the nervousness I was experiencing that was so great, it was expressing itself physically in my body. We have to start taking it serious and that means no longer accepting the accepted wisdom about bullying. Bullying is not a rite of passage. Kids aren’t made stronger from experiencing it. And there actually is something we can do to stop it. We can use science to understand how bullying behavior is rewarded and how to make it stop. Behavior modification programs are actually really easy to teach and fairly easy to implement. And if you want me to do a training – contact me!